FitzGerald, Garret. 2003. 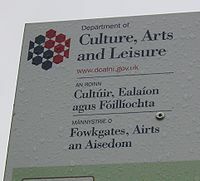 Irish-speaking in the Pre-famine Period: A Study Based on the 1911 Census Data for People Born before 1851 and still Alive in 1911. Dublin: Royal Irish Academy. Goldenberg, Lisa. 2002. The Symbolic Significance of the Irish Language in the Northern Ireland Conflict. Dublin: Columba Press. Hainle, Cathal G. O, and Donald E. Meek. eds. 2004. Unity in Diversity: Studies in Irish and Scottish Gaelic Language, Literature and History. Dublin: School of Irish, Trinity College. Murchaidh, Ciaran Mac. eds. 2004. Who Needs Irish? : Reflections on the Importance of the Irish Language Today. Dublin: Veritas. Watson, Iarfhlaith. 2003. Broadcasting in Irish: Minority Language, Radio, Television and Identity. Dublin: Four Courts. Bradaigh, Sean O. 2000. An Ghaeilge: Why It Is so Important [online]. np: IrelandOn-line, [cited 23 February 2005]. Available from World Wide Web: . Irelandseye.com. nd. A History of the Irish Language [online]. np: Irelandseye.com, [cited 23 February 2005]. Available from World Wide Web: . O'Donnaile, Antaine. nd. The History of Irish. In Irish Gaelic [online]. np: BBC Homepage, [cited 24 February 2005]. Available from World Wide Web: . Wikipedia. 2005a. Irish Language [online]. np: Wikipedia, the Free Encyclopedia, 21 February [cited 21 February 2005]. Available from World Wide Web: . Wikipedia. 2005b. History of Ireland [online]. np: Wikipedia, the Free Encyclopedia, 25 February [cited 28 February 2005]. Available from World Wide Web: . Wikipedia. 2005c. Abbey Theatre [online]. np: Wikipedia, the Free Encyclopedia, 8 February [cited 23 February 2005]. Available from World Wide Web: .